Tippytoe Crafts made adorable Torn Paper Apples with 3D worms. 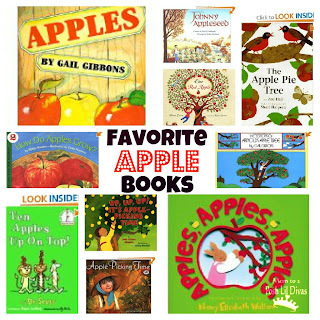 The Usual Mayhem shared 9 Great Apple Books with us. 3Dinosaurs made Fine Motor Fun with their Torn Paper Apple Trees. The Educators Spin On It shared an Apple Pie Cooking Lesson. Living Life Intentionally has a fab A is for Apple Theme post. 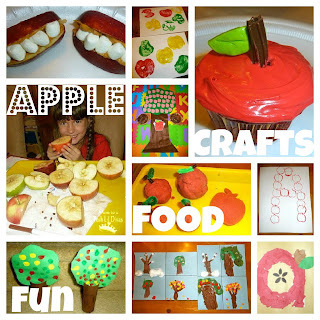 Do you have a favorite apple craft, recipe, play or learning activity? 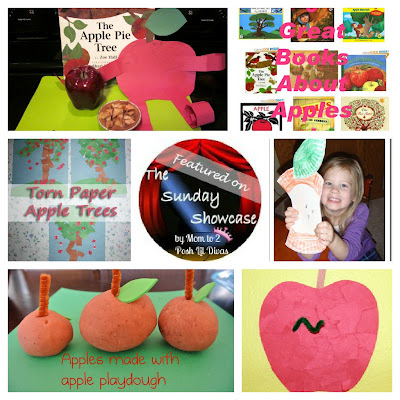 More Apple Books, Crafts & Learning from ME! Thanks for the feature =-) You always have just great ideas on your party. Beth, isn't it fab all that gets shared! I love all the inspiration. Thanks for always popping by and sharing with us. You are wonderful. Thanks for the feature! 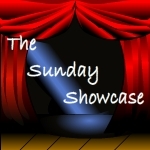 I look forward to the Sunday Showcase every week! Thank you for sharing it with us Eddie. I so look forward to this linky each week myself, the ideas are always so inspiring. I love seeing what everyone has been up to. Thank you Kristi! We are so pleased to have you joining us and sharing your ideas with everyone here. Thanks for featuring our wormy apples! And thanks for hosting such a great party! Thank you for sharing your fun ideas with us Betsy. This linky would not work without all of you taking the time to share your ideas each week. Thanks for the party. I shared a great post for mom's whose daughters have an Easy Bake Oven. EEK, can you believe the Lil Divas got one last Christmas and we have yet to use it! I must read your post - it might inspire me to finally open that box. :) Thanks for sharing with us. I'm looking for some inspiration and there are a lot of great links here! Thanks! So glad you are finding it inspiring here Sandy! There are so many great ideas shared each week by everyone - it amazes me. What adorable Lil divas you have there! Thanks for hosting this linkup!